Film Directors: A Treasure Island. NY: Columbia University Press, 2005. 312pp. After another Pirates of the Caribbean summer, with the latest entry in that trilogy adding to its coffers around the world, a book whose subtitle includes the word “treasure” inevitably conjures up Disneyland images of wooden chests overflowing with jewels and gold coins. As the authors of Taiwan Film Directors: A Treasure Island point out, filmmakers like Chen Kuo-Fu and his counterparts from Hong Kong have often imagined Taiwan as a site of criminality and plunder, a modern-day pirate’s lair for buccaneers wielding handguns, as well as business contracts and cell phones. But Emilie Yueh-yu Yeh and Darrell William Davis also take the word “treasure” seriously, and their book includes a series of meticulous studies of filmmakers who produce work of immense artistic and cultural value. Their study devotes the kind of close attention to image composition and editing patterns that are only worthwhile if that painstaking process yields its own form of intellectual rewards, if it allows the reader to discover dimensions of a film or a director’s body of work that passed unnoticed at first glance. And reading Taiwan Film Directorsis a tremendously rewarding experience. Beyond its contribution as a touchstone history of recent Taiwan cinema and culture, the book will also be an important document for film scholars interested in thinking historically about art cinema, situating these revered documents in their intricate industrial contexts, and balancing the almost unimaginable fortunes generated through the vehicle of the global blockbuster with the less quantifiable contributions of movements like Taiwan’s New Cinema. This focus on “treasures” rather than ubiquitous, popular, globally circulating images marks the book as both an old-fashioned exercise and a vital intervention. In its overall structure–the first two chapters trace the history of post-1949 film in Taiwan and outline contemporary debates in Taiwanese cultural studies, and the succeeding four chapters are dedicated to directors Edward Yang, Hou Hsiao-Hsien, Ang Lee, and Tsai Ming-Liang, respectively–the book follows a pattern that remains familiar after decades of auteur studies. But Taiwan Film Directors also helps reinvigorate many of the seemingly quaint practices that founded the discipline of film studies–the minute analysis of individual films, the “analogical mode” (Eric Rohmer’s term) that follows the development of particular themes across a director’s career, and an understanding of the medium-specific poetics of cinematic production–by demonstrating that they can coexist with an equally profound interest in the economics of the film industry and the politics of representation in mass media. In cinema studies, methodologies borrowed from history, sociology, and cultural studies have largely replaced the auteurist model that was developed in the 1950s and swiftly adopted in the academic discipline that emerged in tandem with it. Art history and literary scholarship had traditionally concerned themselves with rare masterpieces, developing a cohort of connoisseurs who could recognize the value of these precious objects. For film studies to become a serious undertaking in its own right, the history of cinema needed a canon of cherished artworks, and auteur-oriented monographs became the vehicle for that elevation of a primarily popular medium into art. Thirty years ago a book focused on “selected” directors from a particular national tradition would have been organized and marketed as an exercise in connoisseurship, providing the technical justification for the predetermined canonization of particular artists. But Taiwan Film Directors is only a distant relative of those earlier auteur studies, in part because its primary subject matter–the New Cinema of the 1980s and after–is a more recent phenomenon, and, more important, because the authors are insistently aware that Taiwan’s best-known directors are the product of a very specific moment in history, of cultural policies designed to produce internationally recognized artists, and of a film culture that nurtured them, at least for a moment. In other words, the director-centered argument of Taiwan Film Directors is already and inevitably intertwined with a period study of Taiwanese culture from in the post-1949 era, and especially the last quarter century. Yeh and Davis write of Hou Hsiao-Hsien, the Taiwan filmmaker most often envisioned as a singular figure: “Our operating assumption is to set aside a cardinal doctrine of auteurism, which is the singularity of artistic sensibility, and propose instead Hou’s representiveness, if not typicality. Like a lightning rod or a chameleon, Hou’s vision and techniques evolved along with that of a community of artists and cultural workers” (136). Their goal is therefore “to merge institutional historiography with auteurism and vice versa” (136). Taiwan Film Directors thus presents the peculiar case of a film industry that for at least a decade was committed less to financial rewards than to the production of treasures: films that would circulate in the festival and art house circuit, perhaps win some awards, bring needed international attention to the island soon after its political isolation in the 1970s, and develop a low-cost niche industry in a market unable to compete commercially with its main rivals (Hong Kong throughout the 1980s and Hollywood thereafter). In the case of Taiwan, developing a cinema of auteurs was an official industrial strategy and governmental policy, one credited with nurturing the New Cinema, but also criticized for stunting the development of a solvent domestic industry centered on popular genres and stars. 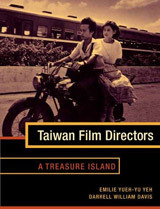 While the first two chapters develop a longer history of Taiwanese cinema–with particular attention to the parallel development of Mandarin-language and Taiwanese films, and to the now-neglected genre of Healthy Realism–the bulk of the book concentrates on the individual directors who have dominated Taiwanese cinema from the early days of the New Cinema to the present. Because each of these filmmakers is already the subject of a vast bibliography, Yeh and Davis do not provide comprehensive accounts of each career, let alone each film. Instead they combine general historical and biographical information with specific arguments that complement the existing literature. The chapters zero in on particular formal or narrative tendencies in each filmmaker’s work: on deep, tunneled spaces in Yang; borrowed (auto)biographies in Hou; the globalization of Confucian morality tales in Lee; and the camp aesthetic that animates Tsai Ming-Liang’s ponderous long takes. The initial choice of whom to include as “Taiwan film directors” inevitably begs the following questions: what does it mean to be Taiwanese, and who counts as an authentic representative of the islands? The pantheon of Taiwan-born directors would be very different from one that includes only those raised there, only those currently residing there, or the few receiving most of their funding from domestic sources. The first of those categories would exclude three of the book’s four auteur-focused chapters, as the mainland-born Yang and Hou migrated to Taiwan as children, and Tsai moved to Taipei for college after growing up in Malaysia. The last of those categories–finances–would make for a very different book, too, with most of the major directors falling not under the rubric of Taiwan film director, but instead qualifying as temporary citizens of France, Japan, or Hollywood. Yeh and Davis sidestep those questions of authenticity, in part to accommodate the most inclusive possible definition of Taiwan identity, and in part because the question of Taiwaneseness lies at the core of so many of the films themselves. While some readers may be dissatisfied by the book’s relatively understated approach to hot-button political issues (nationhood and political independence foremost among them), others will be disappointed to discover that particular films, including Hou’s City of Sadness, are discussed only in passing. When it addresses the subjects that have already generated a vast literature (including the politics of identity in Taiwan and the films of Yang and Hou) the book is best considered a supplement to the most important classic and recent critical texts, and read alongside them. (The online essay on City of Sadness, produced by Yeh and Abe Mark Nornes, would be one important reference point for that particular film.) The critical literature on Yang’s The Terrorizers, for example, like the suite of photographs that lines an apartment wall in the film, only becomes fully visible when viewed as a totality replete with juxtapositions and contradictions. Fredric Jameson’s magisterial piece, “Remapping Taipei,” which situates Yang’s concerns within the context of an emerging global postmodernity, would be a starting point; Sung-sheng Yvonne Chang’s more recent essay on the film (which appears in Chris Berry and Feii Lu’s Island on the Edge: Taiwan New Cinema and After, an indispensable edited volume) considers Yang’s fascination with the very local matter of Taiwanese literary contests and therefore resists the rarefying effects of high theory; and, finally, the chapter on Yang in Taiwan Film Directorsoffers itself as an reconsideration of and rejoinder to Jameson, another attempt to relocate Yang within the specificity of recent Taiwan history. But Davis and Yeh’s “eccentric monograph” is designed less as a replacement for or repudiation of existing scholarship than as a map of the broad landscape in recent Taiwan cinema and search for new positions within an already crowded critical terrain. Yeh and Davis twice characterize their method as “thick description,” and this allusion to the practices specific to anthropology serves as a indicator of where the field of film studies is heading and what it should remember not to leave behind. In the famous essay that opens The Interpretation of Culture, Clifford Geertz develops the term “thick description,” borrowed from the philosopher Gilbert Ryle, into a methodology and aspiration for anthropologists attempting to capture some of the complexity of everyday social interaction. He contrasts a limited and superficial account of an exchange of winks between schoolboys–one person looked at another–with the “thick description” that demonstrates how fraught with connotation even the most simple expression or gesture can be. Each wink implicates the communicator, audience, and bystanders in a web of social relations whose density is apparent in observant and well-wrought anthropological writing. Davis and Yeh’s allusion to Geertz is surprising because auteur-centered criticism is precisely the form of scholarship that distinguishes a traditional mode of film studies from social sciences like anthropology, where a medium of communication is the product of a community of producers and their diverse audiences rather than individual artists. While far from ethnographic in its methodology, Taiwan Film Directors does demonstrate just how thick the atmosphere was in Taiwan during the period of the New Cinema, how each cinematic gesture was addressed to a range of audiences in Taiwan and to very different cosmopolitan constituencies overseas. The book reconstructs the network of social relations documented in these cinematic expressions, from the seemingly uncomplicated wink to the immensely convoluted record of choreographed movements and everyday accidents captured on film in the New Cinema. And the book accomplishes this task because it is also aware that images themselves are thick, that each film is an accumulation of the very scenarios presented in Geertz and therefore demands meticulous attention to both contextual information and the specificities of editing and mise-en-scène. King Hu’s films, they suggest, are “thick” productions (50), full of carefully researched period details. And a propos of Yang’s A Brighter Summer Day: “There’s a thickness in the texture of this film that demands perceptual immersion to properly appreciate it, let alone grasp its more subtle historical allusions” (93). Given the density of their historical allusions and the complexity of their mise-en-scène, Hou’s films could be the most compressed and unyielding of all. Through their awareness of the poetics of cinematic production in Taiwan, Yeh and Davis are able to reconstruct the intricate web of gestures that characterized a moment when Taiwanese culture was returning to its roots on the islands and being incorporated into the global economy, when these filmmakers were at once turning their lens on the domestic politics of Taiwan and receiving accolades overseas. In a book with so many remarkable achievements, the relatively understated moments of description, themselves the product of intense and precise observation, may be the most enduring.